This section of the Nar Valley way starts in Litcham and ends in Gressenhall. Most of the archaeological sites mentioned in the text are on private land, and are not accessible to the public unless mentioned in the text. Priory Farmhouse contains the remains of a 14th century religious building. It may have been a chapel, although in 1410 it was called a hermitage. In the 16th century the religious building was converted into a house and it has been altered and extended on many occasions since. To the northwest of the farmhouse are the remains of a moated site. Much of the moat survives as earthworks, although most of the south and east sides have been infilled. Medieval walls, pottery and a large feature, possibly the south side of the moat, have been found during building work. Houses now stand within the moat. The 17th century and later Priory Barn (now a house) is to the north of the farmhouse and to the east of the moat. Opposite Priory Farm is the site of the village stocks. The White House, Church Street dates from the 18th century and was once a shop. It is built of rendered brick and has a former shop window with a simple entablature and pilasters. The cropmarks and slight earthworks of a medieval moat and a medieval to post medieval trackway have been identified from aerial photographs in the field to the east of Drury Lane. A Neolithic flint scraper and medieval and post medieval coins and pottery have been found on the site. In the field next to the footpath aerial photography has revealed the cropmarks of three ring ditches. When the area was visited, two of the three ring ditches were visible as low mounds and prehistoric flint tools were found on one of those. The footpath runs next to Lounds Wood, which is the site of the moated medieval manor of Greynston that is mentioned in documents dating back to the 13th century. The footpath runs through the site of the deserted medieval village of Grenstein, which was in existence from the 11th century. The village grew up around a green known as Dowes Green or Woodmere Green, and had been deserted by the 16th century. The earthworks of the village were ploughed in 1959, but the village street and the outline of the houses are clearly visible on aerial photographs. To the east of the village site is the site of another medieval manor known as Caley’s Manor. One of the village houses, or tofts, was excavated in the 1960s, revealing a medieval to post medieval farmstead, with a house and a large flint-surfaced farmyard with farm buildings. 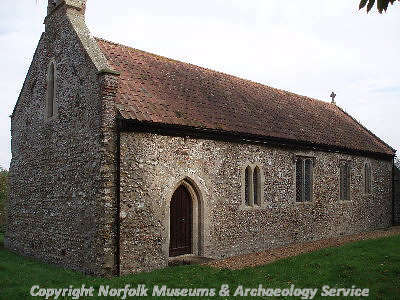 The buildings were built of clay lump, a technique that was still in use in Norfolk in the late 19th century. Fragments of medieval and post medieval pottery and animal bones have been found on the site. As you walk down Back Lane you will see a traditional telephone box with a domed roof. This type of telephone box, the K6, was designed in 1935 by Sir Giles Gilbert Scott. Straddling the B1145, a pre-Conquest road that remained the main east-west route through the county until the 17th century, this is the largest motte and bailey castle in Norfolk. It was constructed in about 1100 and its remains form a surprisingly imposing monument consisting of a motte built up around the fragments of a stone keep, two baileys and a further banked rectangular enclosure to the north of the road, which now contains Burwood Hall (built in 1793) and farm buildings. A large wooded deer park was once attached to the south of the castle. The positioning of the castle astride the road is thought to have been connected with raising revenue from a possible market place in the northern enclosure and from tolls on travellers. It is probable that the castle had fallen out of use by about 1300, but before then the tall keep, probably whitewashed, when seen against the green wooded backdrop of the deer park, would have been an impressive sight. The site of the medieval village of Little Bittering is visible as earthworks. These include at least one moat, a row of village properties (tofts), drainage ditches and possible ridge and furrow. Excavations and fieldwork have uncovered evidence of a prehistoric burnt mound (pot boilers), prehistoric flint artefacts, part of a lava quern stone and prehistoric, Roman, Middle Saxon, medieval and post medieval pottery. A 12th and 13th century church, with a 17th century bell tower and buttresses. Inside there is a late medieval rood screen. By 1954 the church was derelict but it has been restored since. The building stands in an isolated position amongst the deserted medieval village of Little Bittering. 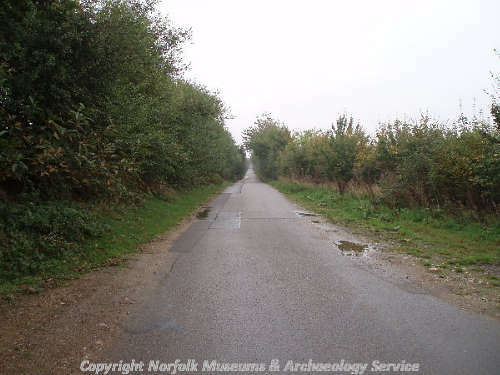 Stony Lane runs along the course of the Fen Causeway, which is the name given to the Roman road that runs from a junction with Ermine Street and King Street near Peterborough across the Cambridgeshire and Norfolk fens. In a number of places the road is visible as a cropmark on aerial photographs, whilst in several places it survives as a landscape feature. Sections of the road have been excavated on a number of occasions, revealing a cambered metalled surface and side ditches. Methodist Chapel and Chapel Cottage on Bilney Road is a 17th century timber framed cottage, with an early 19th century clay lump and brick chapel. The chapel was originally built as a school, before becoming a Methodist chapel in the 1920s. This is the site of a Great Bittering Mill, a smock mill that was sold in 1837. The mill is recorded until the late 19th century. The walk ends near Gressenhall Workhouse. 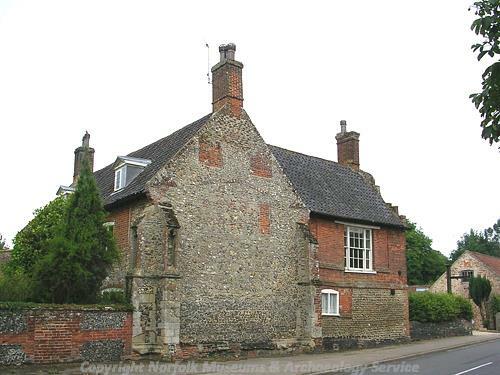 The workhouse was built in 1777, one of the earliest 'Houses of Industry' in Norfolk. The main block and the east wing date from the 18th century, whilst the chapel, boundary wall and other buildings within the complex date from the 19th century. The building was in use as a workhouse until 1948, when it became an old people's home. 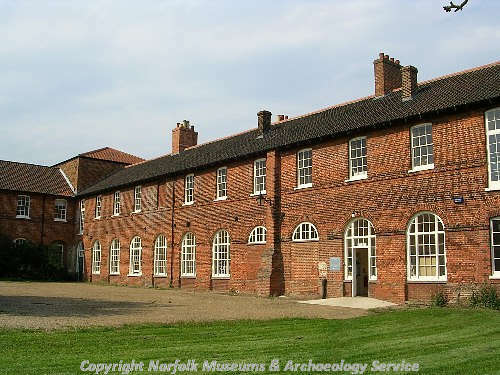 The building is now a museum and the offices of Norfolk Landscape Archaeology. This is the site of the medieval chapel and college of St Nicholas, founded in the 13th century. The chapel held the manor of Rougholme, and the chapel and the manorial buildings fell into ruins by the 18th century. The barn contains some blocks of reused medieval masonry. The present farmhouse may date back to the late 18th century, when the workhouse infirmary stood on the site. 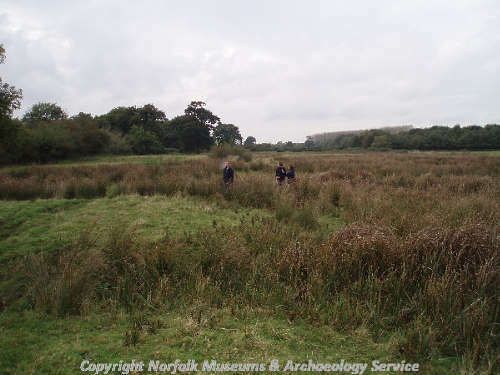 An evaluation carried out by the NAU in 1999 revealed medieval ditches and pits, probably part of a field system, as well as medieval pottery. Sarah Spooner (NLA), Spring 2006.